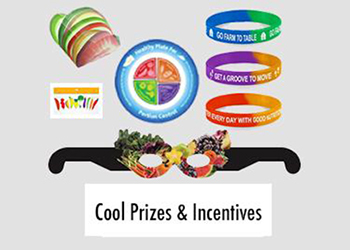 Food and Health Communications is proud to be a National Strategic Partner for MyPlate. As our first community education project, we decided to work on labor-free ways to fill half of your plate for Labor Day. 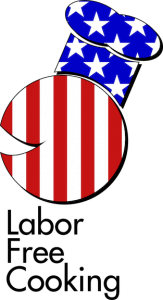 Of course labor-free is always a good thing, not just for Labor Day, right? 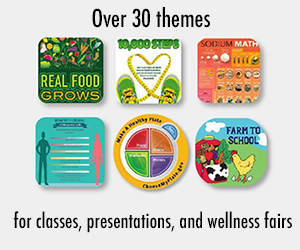 If you are a health educator or teacher, please feel free to use these options for any educational purpose, and if you are a consumer, please pass them along to friends, family, and colleagues. Just remember to include, "Copyright Food and Health Communications, used with permission." 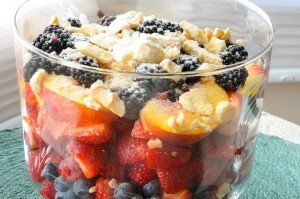 If you'd like to download the PDF file full of these recipes, it's right here: LaborDayRecipes. Here are a few fruit and vegetable options that you can serve buffet-style. Put them out so everyone on your guest list will want to fill at least half of their plates with fruits and vegetables. Use these at your next picnic, party, or family dinner. Be sure to read the whole post so that you won't miss our fabulous fruit dessert finale. 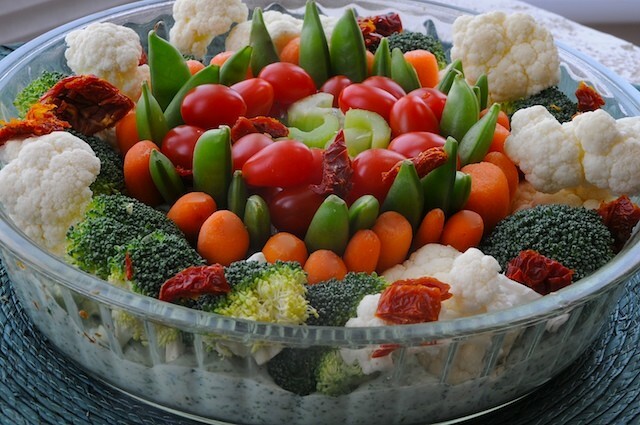 This raw veggie delight can function as an appetizer or a salad. It is made from a standard plastic party tray of raw vegetables from our grocery store. You know, the one that you buy to feel like you are serving something healthful, but that no one really eats. If you take about 5 or 10 minutes, you can turn that mundane-looking plastic tray full of vegetables into something exquisite that will disappear fast! We made a simple spinach dip using microwave-steamed spinach, the ranch dip from the party platter, and a pint of low-fat (or fat-free) ricotta cheese. The spinach dip got spooned into the bottom of a glass tart pan. Then we arranged the raw vegetables standing in the dip, which made the whole creation look like a fruit tart. Anyone can do this, it takes only 5-10 minutes, it's delicious, and it looks great. Since we love to chop, we did cheat and garnish the top with some diced sundried tomatoes, but you certainly don't need those to pull this off in a very colorful manner. The great thing about this presentation is that every vegetable is covered on the bottom with a tasty spinach dip. Puree all ingredients in a food processor or with hand beaters. Pour spinach dip into the tart pan and top with raw vegetables. Arrange the veggies in a circular. You can serve immediately or refrigerate until ready to serve. Fruit is absolutely delicious without any kind of garnish, but the trick is getting everyone to eat it. 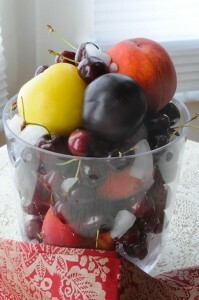 We decided that it would be more likely disappear if it was ripe, chilled on ice, and arranged in a colorful manner. That way, the question is not "do you want fruit?" but "which fruit would you like?" We simply rinsed the fruit and then arranged them in an ice bucket, along with crushed ice. We picked seasonal tree fruits that were ripe and these included: peaches, plums, cherries, and a new item that is a cross between an apple and pear. That's the yellow fruit in the picture below. It was on sale, so we decided to give it a try. 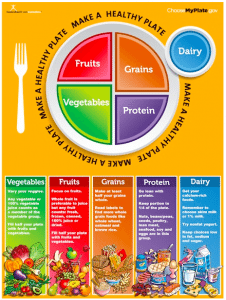 Here is MyPlate, along with the link to ChooseMyPlate.gov. 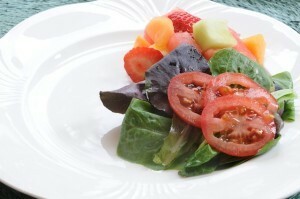 Use the plate to encourage your guests to fill half their plates with fruits and vegetables. Here are easy ways to fill half your plate with fruits and veggies without very much labor at all. The grocery store has these items ready to go, and they're great for Labor Day... or every day! Kids will love this. Why not let them make their own? You can use any combination of veggies to make a unique face. Pineapple cubes, salad leaves, carrot match sticks, halved grape tomatoes, broccoli (nose), baby carrot (smile), and half a microwave-baked potato, with skin. The dressing? Italian spritzer and a drizzle of light ranch dressing. If you don't have a spritzer, you can spoon light Italian dressing or vinegar and oil over the face. (The spritzer bottles are in the dressing section of the store and we love them because they add shine and flavor without a lot of sodium or fat). 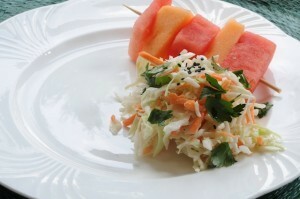 We chose melon on a skewer and cole slaw for a MyPlate theme that goes well with your Labor Day BBQ. The slaw and carrot match sticks were already prepared by our supermarket and we tossed them with a little Light Ranch or Light Caesar dressing. The fruit was already cubed and we just threaded it onto a skewer. Voila! 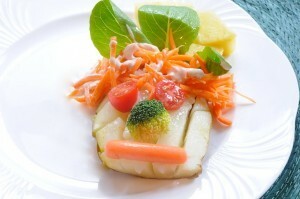 It looks very appetizing because the dressing is light and the slaw is piled high and delicately on the plate. The garnishes: black sesame seeds and rough chopped flat leaf parsley. Another idea for an easy garnish is a shake of paprika. And finally - if you do love to labor in the kitchen (as this author does), here is a great summer salad that can be served on a platter. Heat the olive oil in a nonstick skillet. Saute the garlic until nutty, about 1-2 minutes. Add the eggplant and cook briefly, then add the tomatoes and seasonings. Toss together, then add the vinegar. 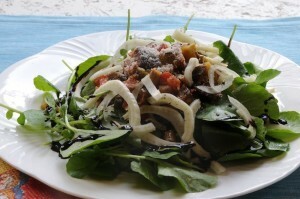 Allow the eggplant salad to cool briefly or overnight (covered in the refrigerator). Toss the watercress with a little bit of olive oil and arrange on a platter. Top with eggplant Parmesan salad and Parmesan cheese. Garnish with shaved fresh fennel, a squirt of balsamic vinegar glaze, and black pepper. 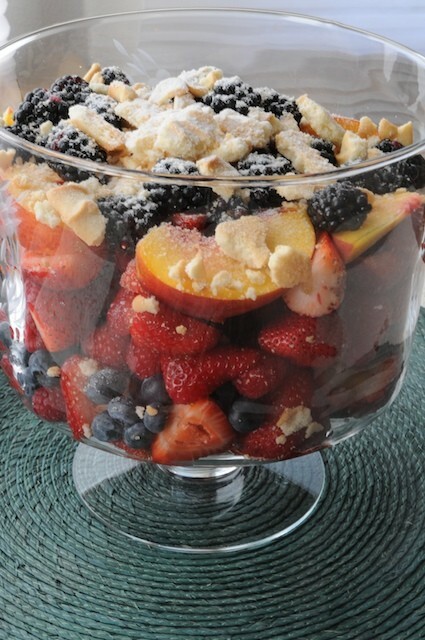 Here is a wonderful fruit dessert that will add more servings of fruit with little added fat or sugar (and very little labor!). It is a collection of fresh fruit layered in a trifle bowl that is topped by crunched lemon or vanilla wafers and a little powdered sugar. You don't have to heat the oven or add a lot of sugar and fat to the fruit. There is little clean up and this looks great after just a few minutes of work. 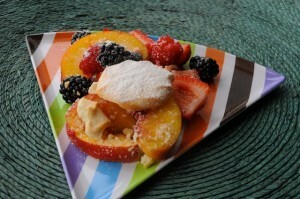 We did wedge the peaches and halve the strawberries, but the total prep time is 5 minutes. Whipped cream is optional. 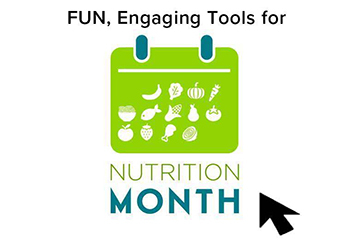 These ideas and presentations are sponsored by the NutritionEducationStore.com - click here to see all of our MyPlate education items, including free stuff like a MyPlate game, a free MyPlate poster download, and free MyPlate handout. 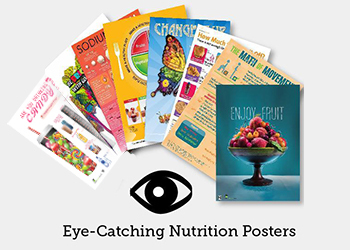 We also see MyPlate posters, a Spanish MyPlate poster (MiPlato), tearpads, games, and PowerPoint shows. Thank you for reading! Happy Labor Day! And Happy MyPlate Presentations! (For more information or high-res images you may click "Contact Us" at the top of the page). 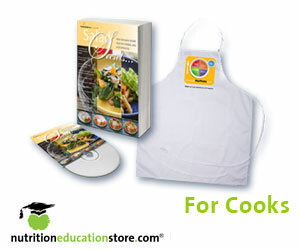 If you are reusing this information, please indicate, "Copyright foodandhealth.com, used with permission." We encourage everyone to pass them along and reprint.